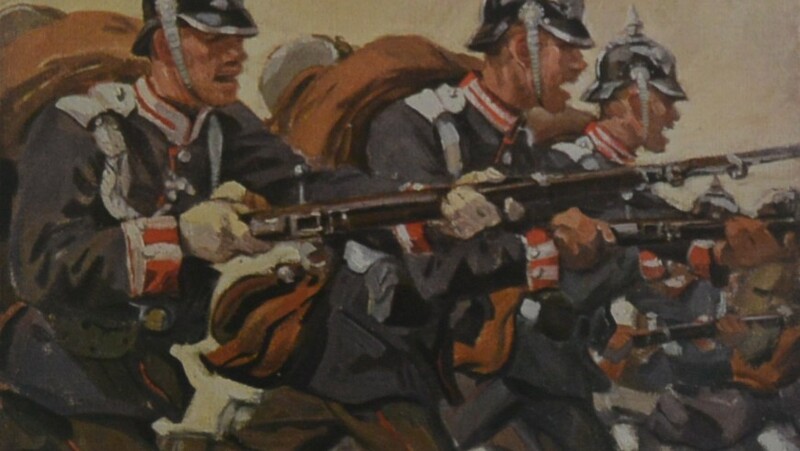 On the 28th of June 1914, in Sarajevo, Gavrilo Princip, a militant of the irredentist organization Young Bosnia, strikes the Grand Duke Franz Ferdinand, heir to the throne of Austria-Hungary, together with his wife Sofia, to death. 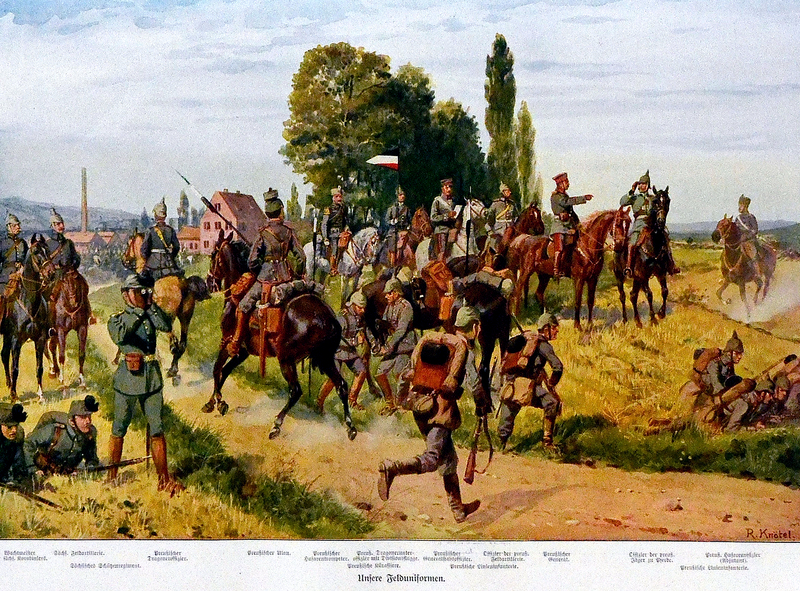 Just a month later, on July 28th, the Austrian Emperor Franz declares war on Serbia and the next day bombarded Belgrade. 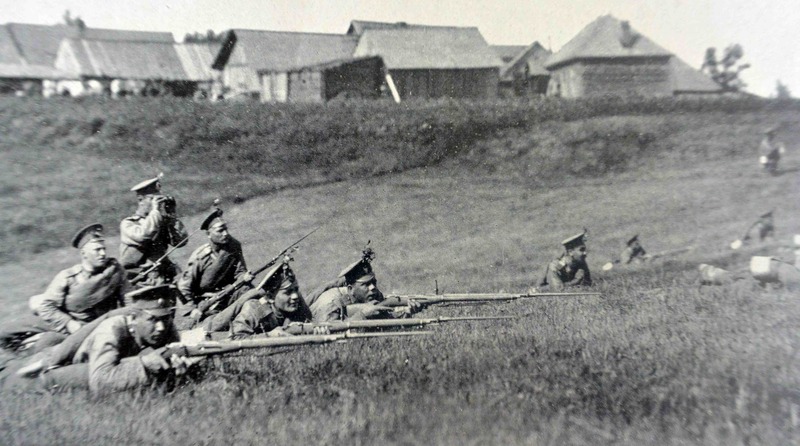 On August 1st, Germany declared war on Russia, and two days later on France. This triggers the conflict that will involve the world that mattered for four years, and that will result in between 15 and 20 million deaths. 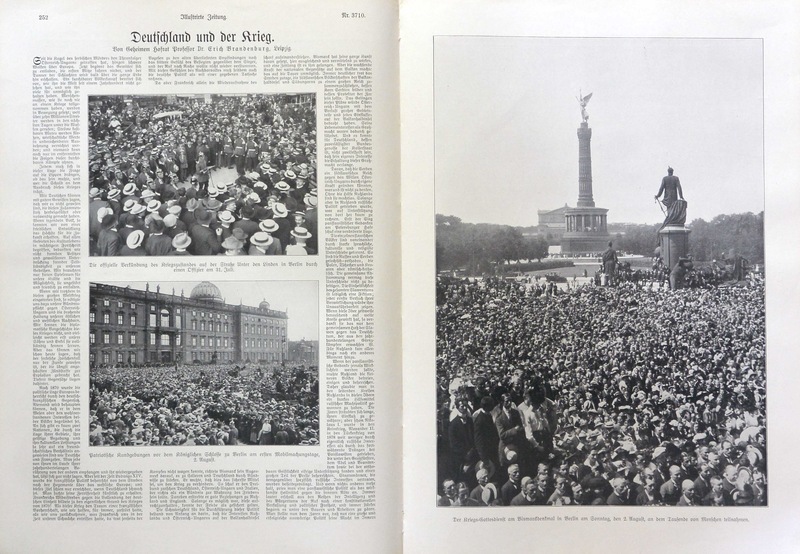 Yet even before the declarations were received by the ambassadors, at that time this was what was done, with the fair play of the good old days, the most popular German illustrated weekly, printed in Leipzig, the Illustrirte Zeitung, in the July 30th number, the 3709th, published photographs and illustrations that left no doubt about what was going to happen. 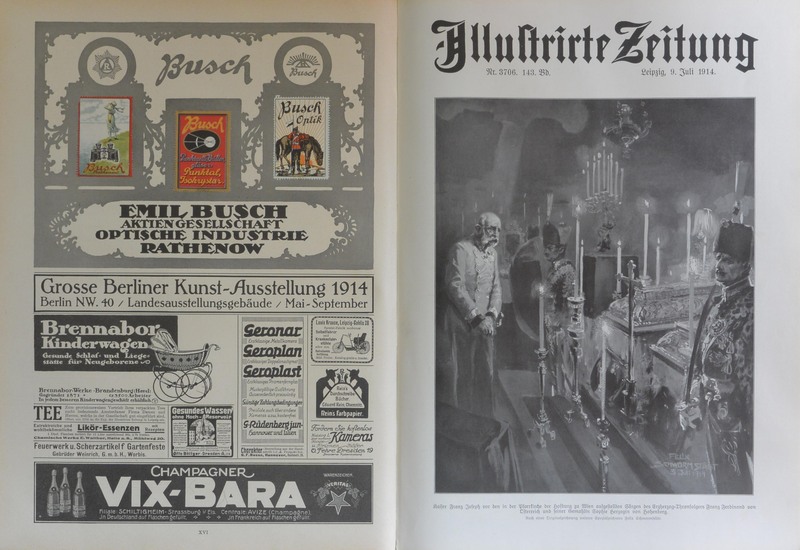 It was customary for the magazine that Johan Jacob Weber founded on July 1st, 1843. The promptness in the news should not be surprising! 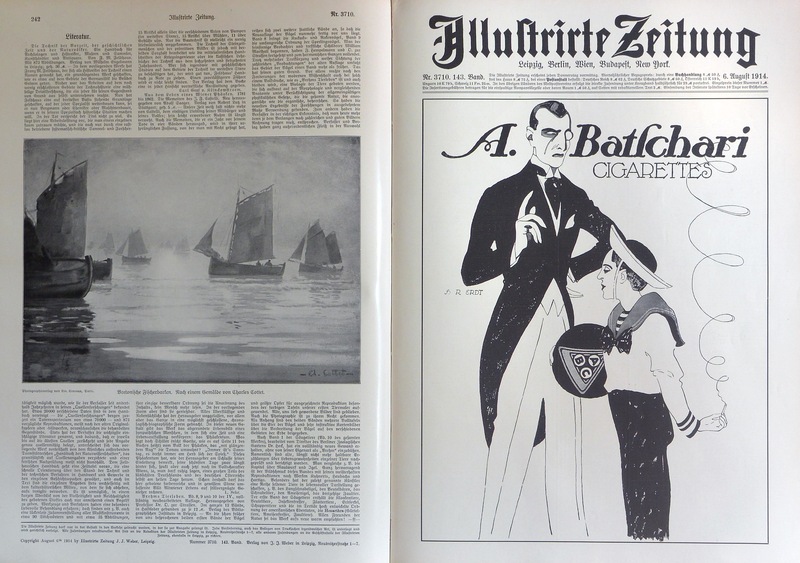 The illustrated weeklies at the time had in Europe, a large following of readers and therefore so many resources available and correspondents where they should have been. 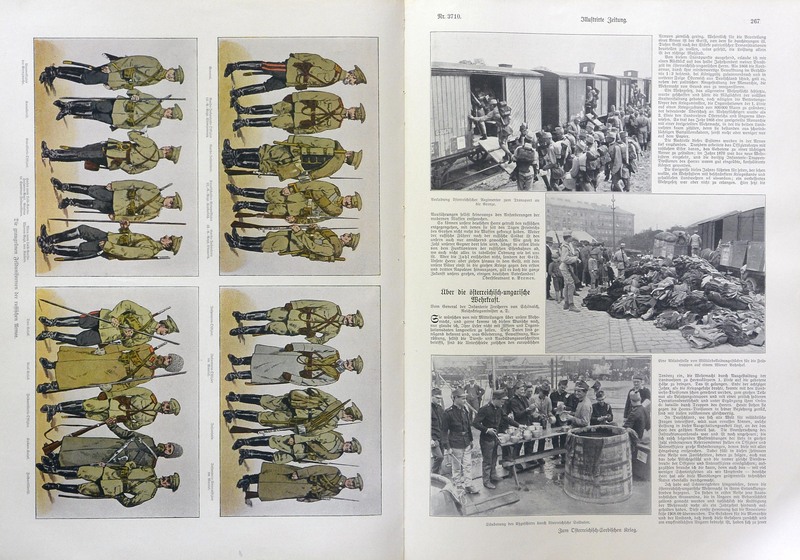 The first periodical of this kind was the Illustrated London News, which had appeared in London on May 14th, 1842, it cost 6 pence, dispensed sixteen pages, an absolute novelty, sixteen illustrations, line drawings, reproduced in xylography. No longer just words, therefore, in the press that claimed greater credibility and a respectable circulation: features that are typical of journalism for (or with) images. 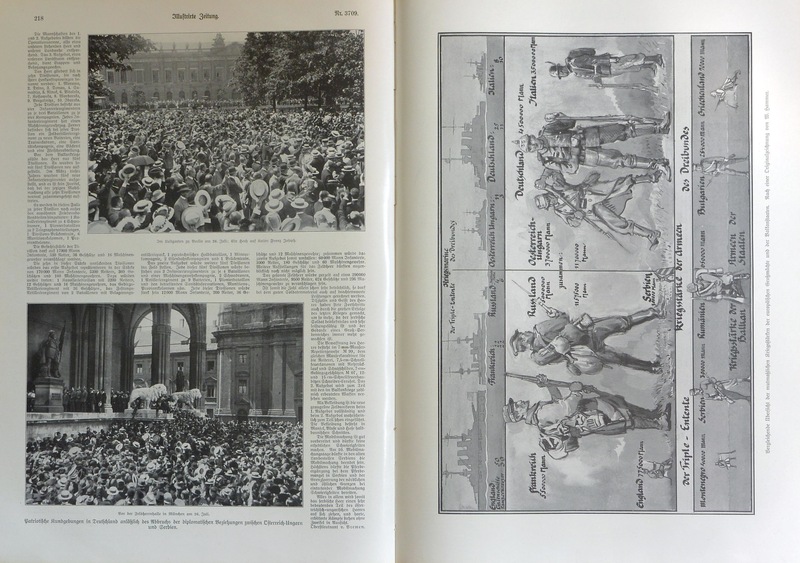 Even in Paris, where one could not be outdone, on March 4th, 1843 L’Illustration Journal Universel left the printers for the kiosks and will live exactly a century, and will bring the first scoop of the history of photojournalism in July 1905: the publication of photographs of Potemkin, the Russian battleship famous for the mutiny of its crew, while all its competitors had put photographs of other warships from the archives. 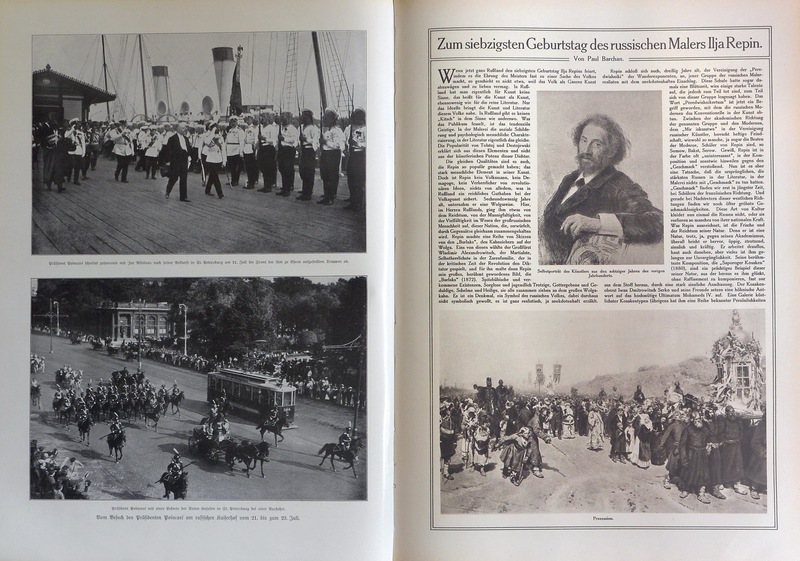 L’Illustration, in its pages also hosted the first photograph in black and white, in 1891, and the first in color, in 1907. 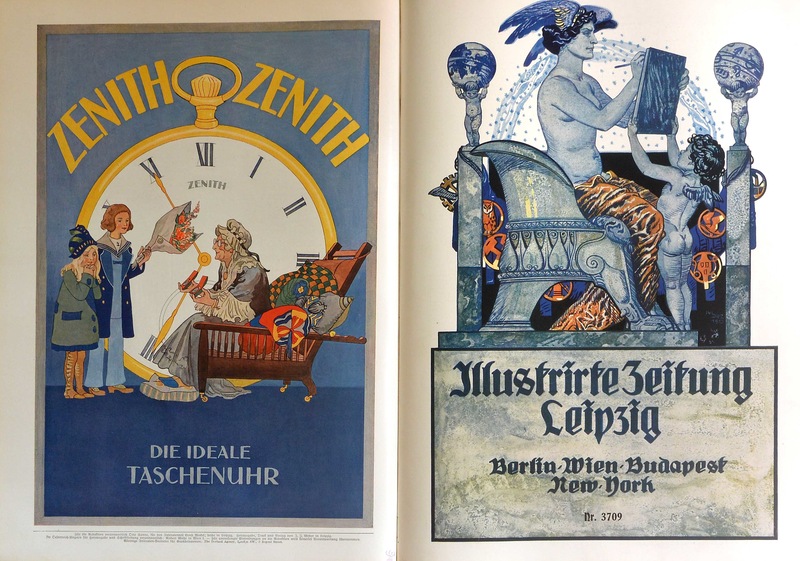 In Italy, a few decades late, Emilio Treves published in Milan, in 1873, La Nuova Illustrazione Universale that two years later became L’Illustrazione Italiana, magazine that will become monthly in 1951, and will precede La Domenica del Corriere, that also had a century of life from 1889 to 1989, and la Tribuna Illustrata that arrived for the readers one year later, in 1890. 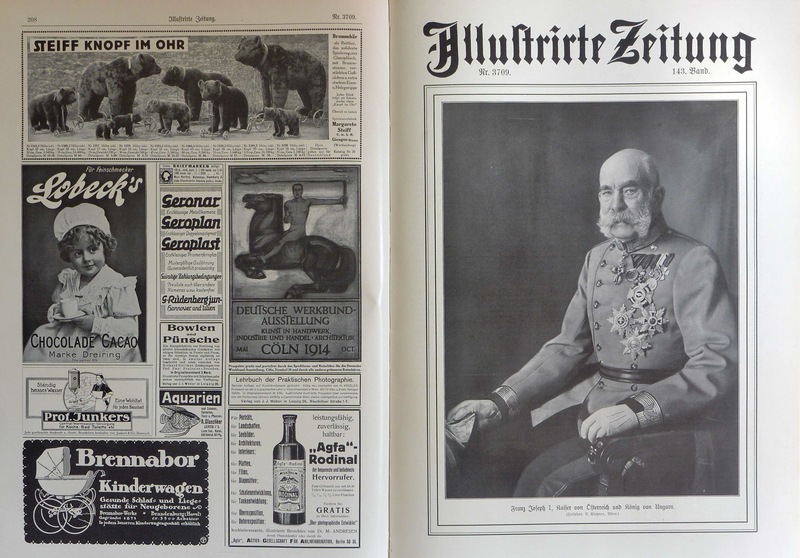 Here we reproduce some double pages of Illustrirte Zeitung relating to the period of the outbreak of the war. 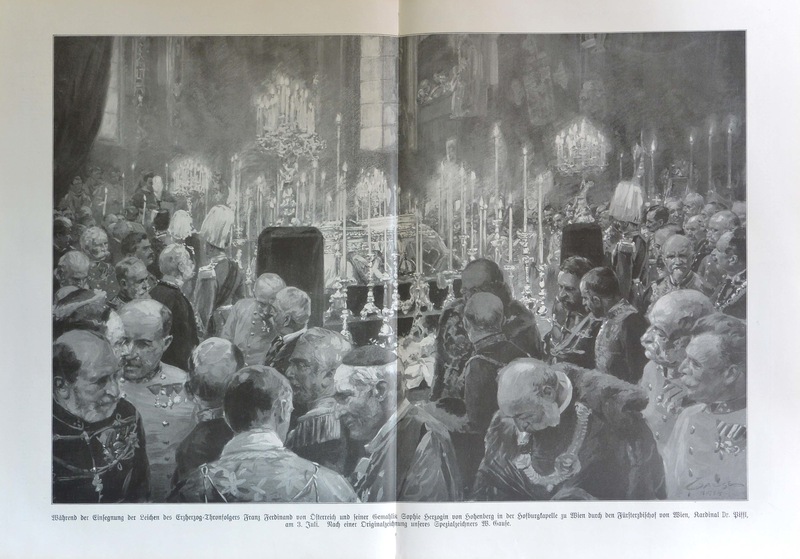 Note that to describe the ceremonies that took place indoors illustrations created by designers and painters were still used, because of the technical difficulty to take pictures in low light conditions. 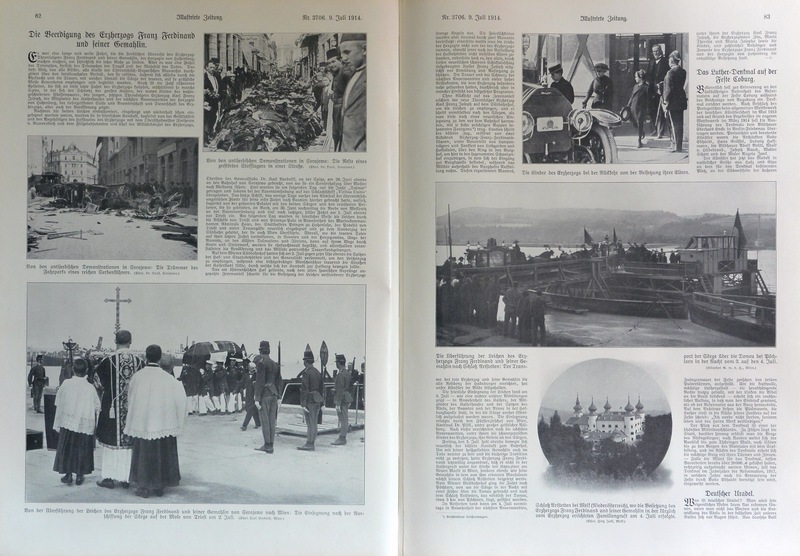 on page 218, in number 3709, photographs of the crowd, in the Lustgarten in Vienna and the Feldherrnhalle in Monaco, praising the impending war. 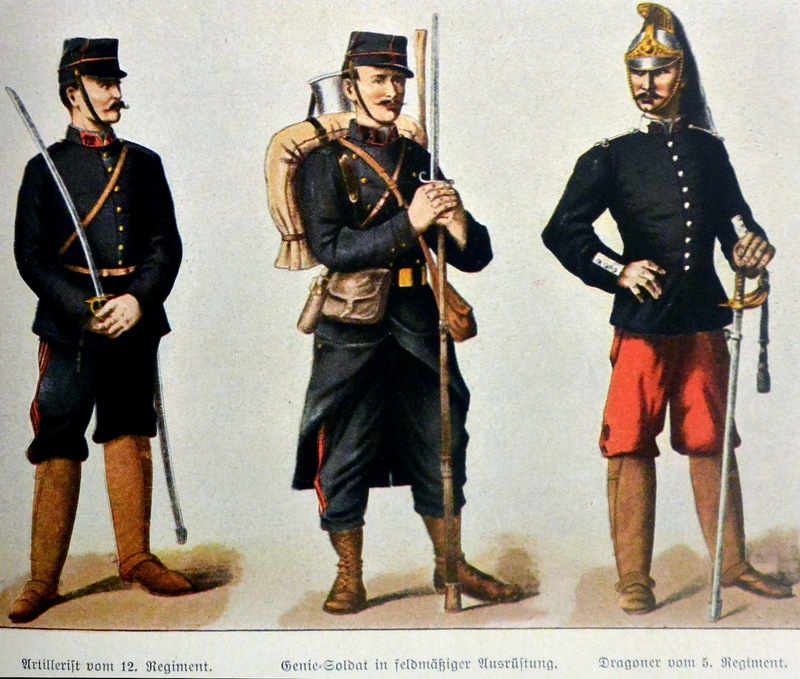 In the next page the foreseeable opposing sides of the countries bound by the Triple Entente and the Triple Alliance. 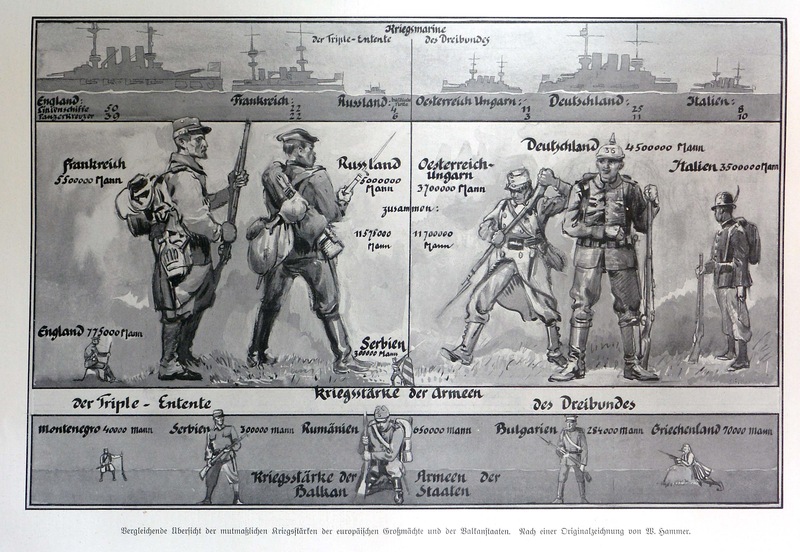 Italy did not take to the field alongside Austria and Germany, claiming that the pact signed between the three countries involved armed intervention only in the case of defense – a pagina 218, nel numero 3709 le fotografie della folla, al Lustgarten di Vienna e davanti la Feldherrnhalle a Monaco: si plaude alla guerra imminente. Nella pagina accanto i prevedibili schieramenti contrapposti dei paesi legati dalla Triplice Intesa e dalla Triplice Alleanza.